Nintendo Switch and it’s fame are not hidden from anyone but what is fascinating about this portable console is that how many companies want to jump on the whole Switch bandwagon. This year, Nintendo outsold every one in all departments and the Black Friday sales proved more than just a point that Nintendo is back. While games were sold a lot but they were not close to the amount of accessories that were bought by gamers for Nintendo Switch. Battery packs, Cases, Covers, Stands, Skins, Memory Cards are many more. It is not surprising that Switch owners want to dress up their console and make their time spent on it more exciting and memorable. YesOJO Studio, a Hong Kong based company took it upon themselves to create something different. A projector for Nintendo Switch, and not just some projector but a portable wireless one. Very fitting given the owners of the console are not big fans of wires. Besides Plug & Play it has a 3.7 V – 20400mAh LG battery that can keep the projector running for 4 straight hours. If that’s not enough, if you are not using it, it can serve as a power bank and charge your Switch or cellphone. It also has a built-in cinematic 5W, 8 ohm speaker, because why the heck not. It can project up to 120″ screen in HD but also has an HDMI support up to 4K. The hardware itself is compact so it is travel friendly for it was purposely built to be portable. 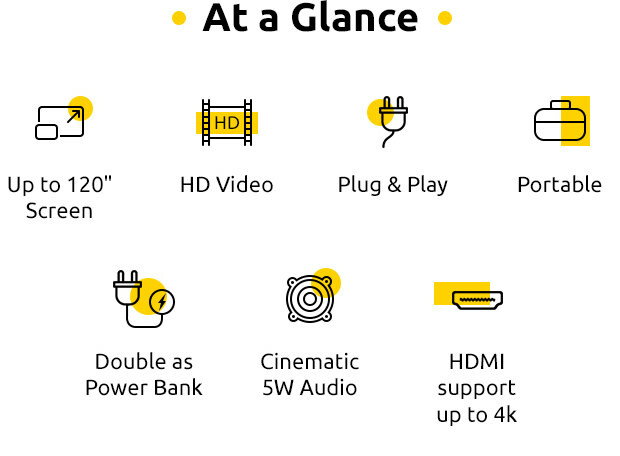 Aside from having the usuals such as an HDMI port, it also has 2 USB 3.0, One USB-C for Power input and one for charging Nintendo Switch itself. 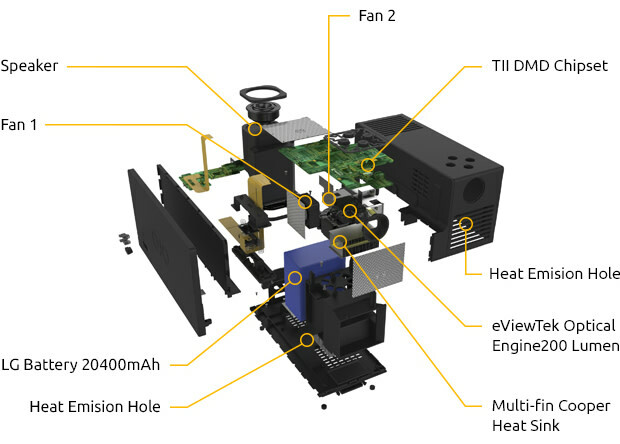 The device also has dual cooling system with 2 turbo fans & copper radiators that keep both the projector and Switch cool. With 200 Lumens and estimated 20000 hrs of bulb life the projector supports 16:9 aspect ratio with the resolution of 854 x 480 pixels and contrast ratio of >10000 : 1. There is also a 3.5 mm AUX out just in case the built-in speaker is not enough. The company has packed everything in this small little package. The moment you get it out of the box, it is ready for multiple tasks. Besides it is not limited to gaming because Switch also features the popular streaming service Hulu and soon will have Netflix as well so the projector can serve as a small home theater with a 120″ screen. Best part of the OJO projector is that you can use it literally anywhere. 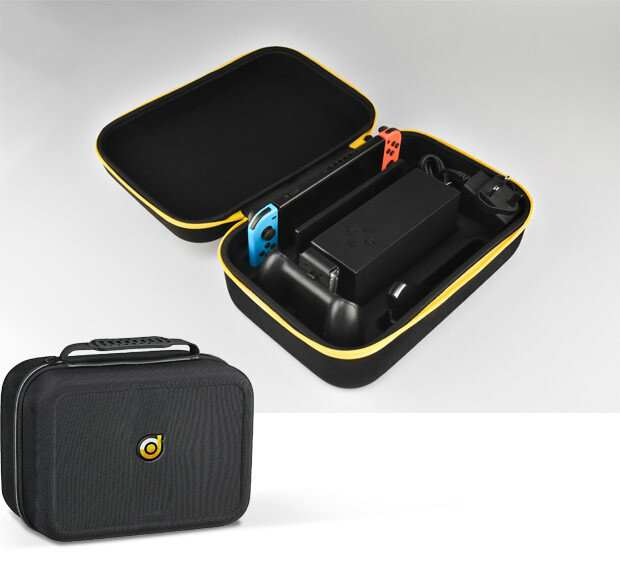 For $299 you get the OJO projector and Element-Proof Carry case that fits the projector, Switch with dock and the joy-con grip. An Indiegogo project that set it’s goal on something very challenging and ended up executing it to perfection. 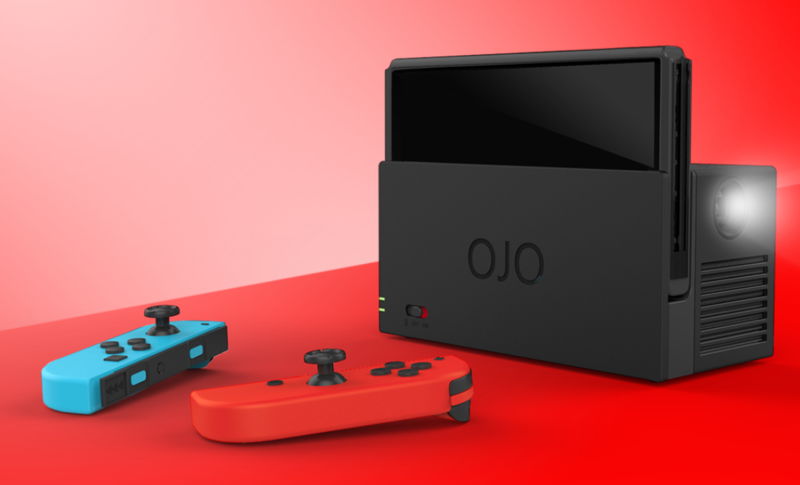 Right now I consider OJO Projector to be among some of the best accessories for Nintendo Switch. Holidays being around the corner and all, this would make one amazing gift for your loved ones or for you even.